Without disrupting your business, Handy Man Handy can make the most out of the space you have in your office to give it the makeover and utter change around it craves. So if you would like your office to look different, more professional and more spacious without having to move to a new office, use our professional office refurbishment service and we’ll do all of that for you at minimum costs. Moving, for most people, just isn’t an option. It drains you of time, energy and the last your company needs is to be delayed because of moving chores. So you can look forward to a new office without having to relocate. How great is that!? 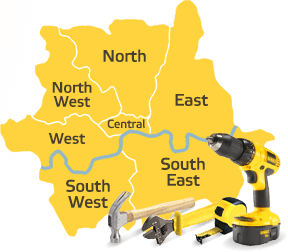 Call us now on 020 8434 7477 to find out more about our services and get a free quote! Use our handymen today. Of the many things that make us an incredible company, we have our refurbishment team largely to thank for being such a successful company. These guys are incredibly talented, skilled and experienced, which means you don’t have to worry the next time you need an office makeover. Instead of wasting money, time and energy relocating, use our refurbishment team and your office will look changed and refreshed. Our team can work whilst you are still sat at your desk. You won’t even know we are here. Our team is the best! We’ll manage everything, meaning you won’t have to worry about a thing. We will survey your office prior to beginning work to check its layout and to see what we can do with it. We like to make sure we make the most of space. Our creative team will definitely provide you with some impressive results. We want to ensure that our design meets your every need. Use our office refurbishment services today and you will see why we are one of the most famous companies in town for office renovation. Our office repairs services are great and even better, our prices are great too! Indeed, there are lots of benefits to hiring us for office refurbishment so make sure you go ahead and book with us now. We really are the perfect company if you seek office maintenance and we promise that when you book with us, you will get everything you need and much more because, in our opinion, you are totally worth it. There are lots of advantages for you to enjoy when you hire us now. Moving isn’t an open option for the majority of people because of course it costs a lot of money and not just that, it starves you of hours of work. Why waste time when you could easily hire us for an office maintenance and in doing so, you will save absolutely lots of time and energy too. Plus, it is much cheaper. We offer excellent services for you to make the most of so don’t hesitate to get in touch with us now 020 8434 7477 if you would like our professional help and expertise. We’ll design your office so that it is luxurious, spacious and set up for clients. It will look amazing in the end after our input. It really will.